WOOvie Editorturn hours of editing to just minutes! WOOvie for Mac cuts the crap: hours of editing to just minutes. Every jump from your session is cut and organized so you can easily overlay height, airtime, and landing force. *Note: WOOvie currently support sessions recorded in Kite – Big Air mode. Shoot with your favorite camera: GoPros, iPhones and DSLRs all work! Sync up your WOO data to automatically clip out every jump. 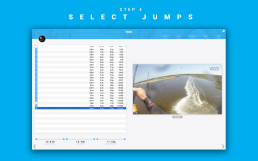 Quickly filter and sort your session's best jumps to add to your WOOvie! Easily overlay stats, including jump height, airtime and landing g-force for each jump in your session. Film yourself starting the WOO session (WOO blinking RED) and you’re all set for a WOOvie! Start and stop your video as many times as you want throughout the session. Open WOOvie on your Mac and login to your WOO account. Select the video clip(s) from your WOO session to import. Keep in mind, the files can still be on your memory card, as the WOOvie creates new files on export! Select the WOO session your video is referencing. If your camera’s date is set accurately, the WOOvie Editor will choose the correct session by default. Sync your footage by choosing the moment you start your WOO session (always film the button press!) Align two jumps to verify the accuracy; use the cursor to select exactly when your board left the water. Boom: this is the exciting part! Here you have an overview of all your jumps with an accompanying video clip. Check out your biggest boosts, hardest crashes, and steeziest tricks. You can filter your jumps down by selecting a range of heights, airtimes, or G-Forces, or by deselecting them manually. Drag clips into whatever order you like, rotating clips that were filmed upside down. Export your WOOvie to your liking! You can export each jump as it’s own video clip or one combined WOOvie edit. Choose which overlay you prefer, set your export location, and hit the export button to finish! Share your WOOvie to Facebook, YouTube, Vimeo and more! Add #woovie for a chance to be featured by WOO!